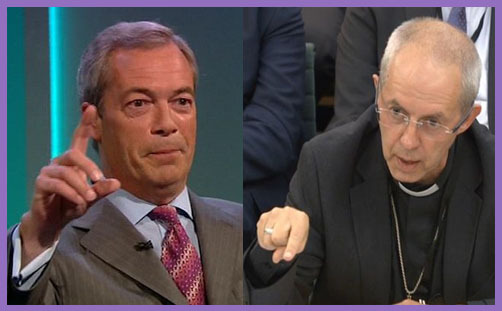 It wasn’t so much a Farage-Welby ‘clash’, not least because the Ukip leader said live on TV: “I’m not going to stand and attack the Archbishop of Canterbury, but he would have done better to read what I actually said…” The clashing was all the Archbishop’s: Nigel Farage’s response was a reasonable exhortation for the Archbishop to study the primary source. But the headlines following the first appearance of an archbishop of Canterbury before a parliamentary select committee were dominated by Justin Welby ‘s criticism. Nigel Farage was accused of “legitimising racism” for suggesting that by remaining in the EU we make the risk of assaults like those in Cologne on New Year’s Eve more likely in the future. The Archbishop accused the Ukip leader of “accentuating fear for political gain”. The headlines could (and perhaps should) have been concerned with the use and abuse of fear. After all, if “accentuating fear for political gain” is “absolutely inexcusable” (the Archbishop’s words), why should one excuse the Cameron-Osborne axis of ‘Project Fear’ which is manifestly trying to scare the bejesus out of everyone in order to bolster the Remain campaign? As Lord Carey observed, the pervasive Remain spin is that Brexit “will bring about the coming of the four horsemen of the apocalypse”. Is the ‘Stronger In’ campaign of terror not also absolutely inexcusable? Of course, the Archbishop of Canterbury wouldn’t dream of attacking the leader of a main political party – let alone the Prime Minister – during an election campaign, lest he may influence public opinion and affect the outcome of the election. But Nigel Farage is fair game – especially when he’s due to debate the Prime Minister live on TV that night – and influencing the EU Referendum toward a Remain outcome is a moral, righteous and enlightened thing to do, even if it means embroidering a bit of fear about the Ukip leader. But if fear is the Archbishop’s overriding pastoral concern, it might be considered that David Cameron and George Osborne have fanned a few more flames and stoked a few more fires than Nigel Farage has done during in this campaign. It was the purposeful design from the outset, but not a word from the church about that. “The nuclear bomb this time would be about Cologne,” he told the Telegraph. Women may be at a particular risk from the “cultural” differences between British society and migrants, after gangs of migrant men allegedly launched a mass sexual attack against hundreds of women in Germany last New Year’s Eve, he said. The extract is useful because the testimony is that of a policeman, who isn’t likely to be making his comments for political gain. It was the German State Interior Minister Ralf Jaeger who said that migrants were almost exclusively responsible for the attacks on women in Cologne on New Year’s Eve. Is it ‘racist’ to say so? Why should the assumption be one of political gain? Why is it ‘racist’ to sound the alarm and warn Britain that continuing the EU policy of uncontrolled mass immigration might become a cause of inter-cultural brawls and violent sexual assaults on women? Why is it ‘racist’ to state quite reasonably that if you give EU passports to a million immigrants, some of whom have a particularly primitive view of women, a few hundred of them are likely to perpetrate the same sort of sexual violence on the women in those countries to which these new passports permit freedom of movement? Even if you instinctively refute causality, it does not make the judgment itself ‘racist’. When churchmen such as Cardinal Reinhard Marx, Archbishop of Munich and Freising and President of the German Conference of Catholic Bishops, decry the “new forms of violence and especially the inhumane treatment of women”, he’s not referring to Teutonic gynocentric innovations: the problem he highlights is that of mass immigration, and specifically the alien cultural attitudes of many Arab and North African men toward white women. Have we not seen it ourselves in Rotherham, Oxford and Sheffield? Is it ‘racist’ to point out that the paedophiles and child-groomers were predominantly British-Pakistani Muslim men who considered their white victims to be “easy meat“? Is it ‘racist’ to point out that cultural attitudes differ and collide? Indeed, but you were criticised when you raised those issues because immigration is that kind of subject. Whenever you talk about immigration, whether it is in or out of context, people will accuse somebody of being either a racist or not a racist. Do you think there is a line between those who have genuine concerns about it and those who use the immigration issue for party political purposes as part of a campaign of fear? I am referring in particular to the comments of the leader of UKIP, Nigel Farage, who said over the weekend that our staying in the European Union could lead to sexual attacks like those we saw in Cologne. That is exactly what he said. I would regard those comments as racist, as would a lot of people. What is your take on what he has said? Justin Welby: I would agree with you. That is an inexcusable pandering to people’s worries and prejudices. That is giving legitimisation to racism, which I have seen in parishes in which I have served and which has led to attacks on people in those parishes. We cannot legitimise that. As I said, fear is a pastoral issue. You deal with it by recognising it, and by standing alongside and providing answers to it. What that is is accentuating fear for political gain, and that is absolutely inexcusable. Chair: So you would utterly condemn the comments made by Nigel Farage. Thank you, indeed. As Keith Vaz said: “Whenever you talk about immigration, whether it is in or out of context, people will accuse somebody of being either a racist or not a racist.” Out of context, the slur is almost inevitable. Out of context, omitting all mention of nuanced distinctions and voiced by the leader of Ukip, the slur is inescapable. Funny, isn’t it, how bishops can inculcate the fear and loathing of antithetical politicians for their own dreams of Christendom.